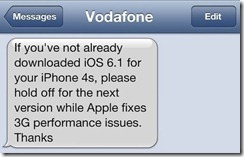 Vodafone text users asking them not to update to iOS 6.1 because it 'impacts performance on 3G'. 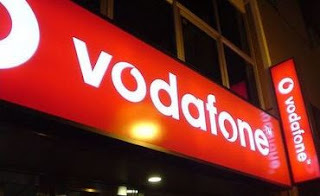 The other day we heard about how Vodafone's CEO labelled 4G networks for 'technofreaks'. Today though the news is slightly more sensible as we've heard that the company has been texting some of their iPhone users warning them not to update their devices to iOS 6.1 if they haven't already! Some people have been reported that their devices have been iperating without any problems, but if you rely on your phones it's not worth the risk! Apple is already working on iOS 6.1.1, which has been released to developers as a beta, so there's the possibility that this contains the fix for the issue! 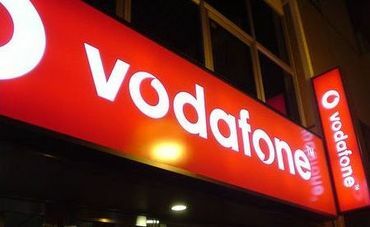 Given the fact that Vodafone felt the need to promote this publicly we would expect that this is a bigger issue then the standard firmware updates cause, so just hold out a little longer if you haven't updated already!